Elon Musk's SpaceX will launch Israeli Moon Lander Beresheet on Thursday February 21 at 8:45PM EST (February 22 at 3:45AM IST, 1:45 GMT February 22) on a Falcon 9 rocket from Cape Canaveral. If the mission is successful this will make Israel just the 4th nation to land on the moon after the US, China, and the Former Soviet Union. 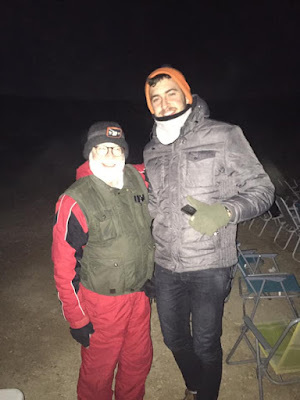 Eitan, a volunteer with SpaceIL on tonight's star tour. 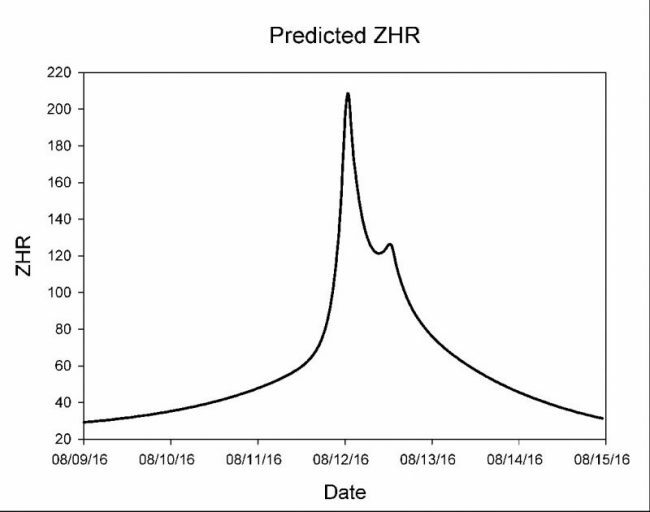 Well, the Perseids have come and gone for the year. The night was beautifully clear and dark. One of the best I have seen this year. The Alpaca Farm set up a wonderful location for the star party, dark skies and plenty of space to sit or lie down and watch the sky. About 100 people, including children, were in attendance. Ziv lead the Hebrew tour and I led the English tour. We were out from about 8:00pm to 3:00am. 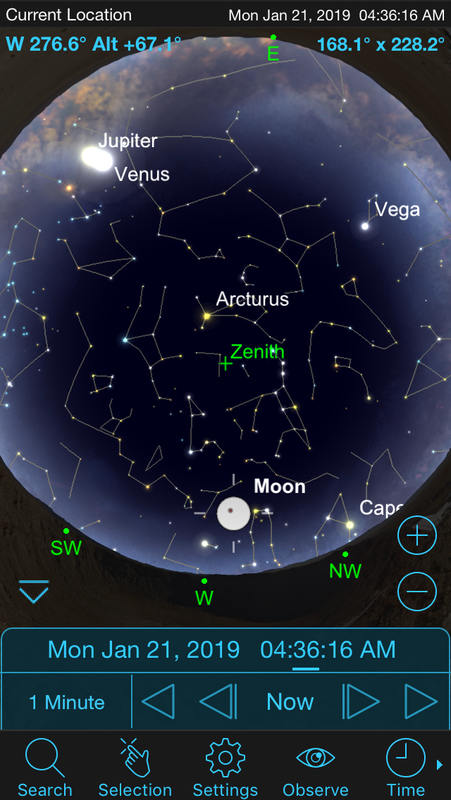 The meteor shower got off to a slow start, and we didn't start seeing lots until after midnight. But then the show picked up and we were sometimes seeing several every 10 seconds. 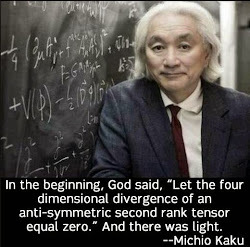 But meteors fall in bursts, not continuously. I don't think we ever reached the maximum rate of 100 per hour but around 2:00am, near the peak time, we were probably averaging around 30 per hour. Most were short, bright bursts of light. I held my meteorite raffle lots more than once per hour, and many happy people went home with their own meteorites. I'm already looking forward to next year's show. In the mean time stay tuned for the next star party on December 13 (Thursday night) when the King of the Meteor Showers, The Geminids, peaks. 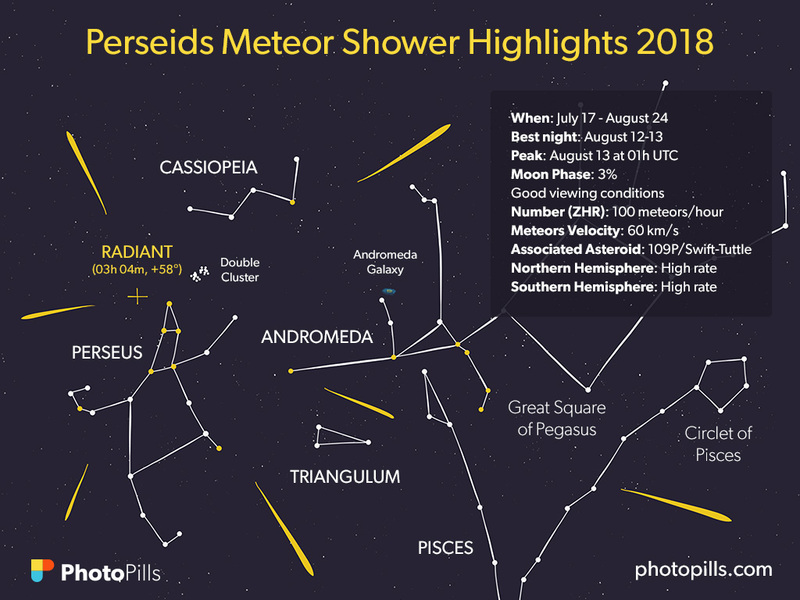 The best meteor shower of the year, the Perseids, peaks this year (2018) on Sunday night August 12 into early Monday morning August 13. 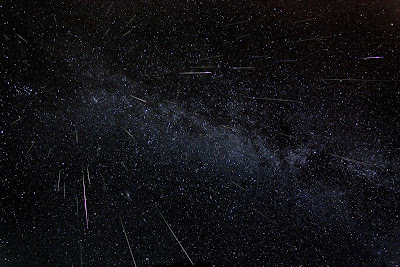 The shower has peak rates of over 100 meteors per hour, and since it occurs in the warm summer months is a popular summer star gazing activity. To help celebrate the event Mitzpe Ramon is turning off all its town lights after 10:00pm and hopefully the other lights from military bases in the area to create an especially dark sky. The darker the sky, the more meteors we see. Mitzpe also holds a town star party which this year will be located in the Machtesh to avoid over crowding the town with the thousands of people who usually come to see the event. 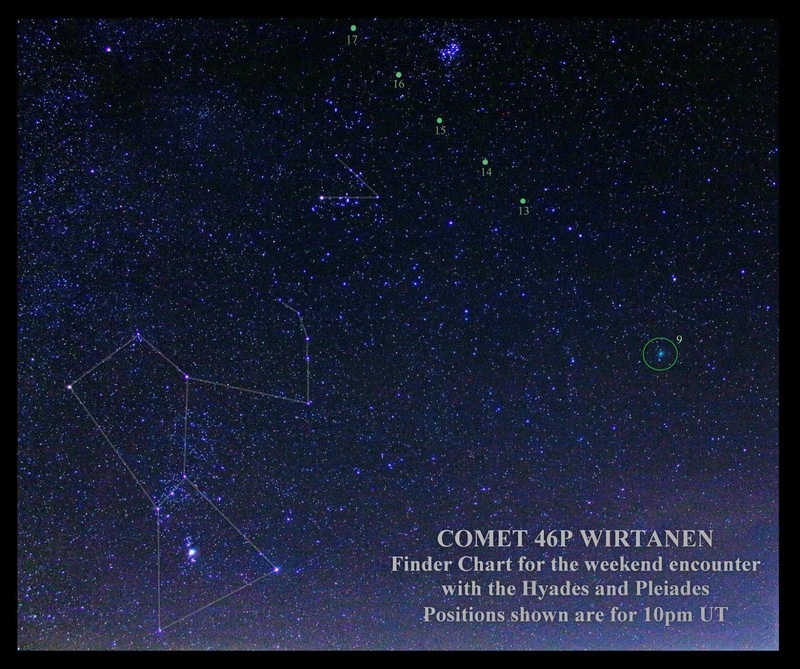 During the day up to 20:00 there will be various astronomical events and free lectures around town. Details here. 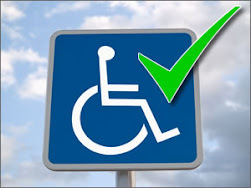 Hotels fill up quickly so if you are coming you should reserve your rooms immediately. Astronomy Israel will be having its own star party on August 12 with special star party pricing of 75nis/person over the age of 6, no charge under 6. This is a big discount from our regular star tour prices, but we want every one to be able to come and enjoy the show. We will be out most of the night from dusk until whenever. 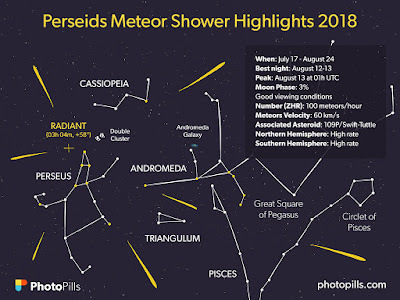 This is an especially good year for the Perseids since there is no moon in the sky, as the moon is new on Sunday night and sets with the sun. A bright moon severely interferes with seeing the dimmer meteors in a shower. 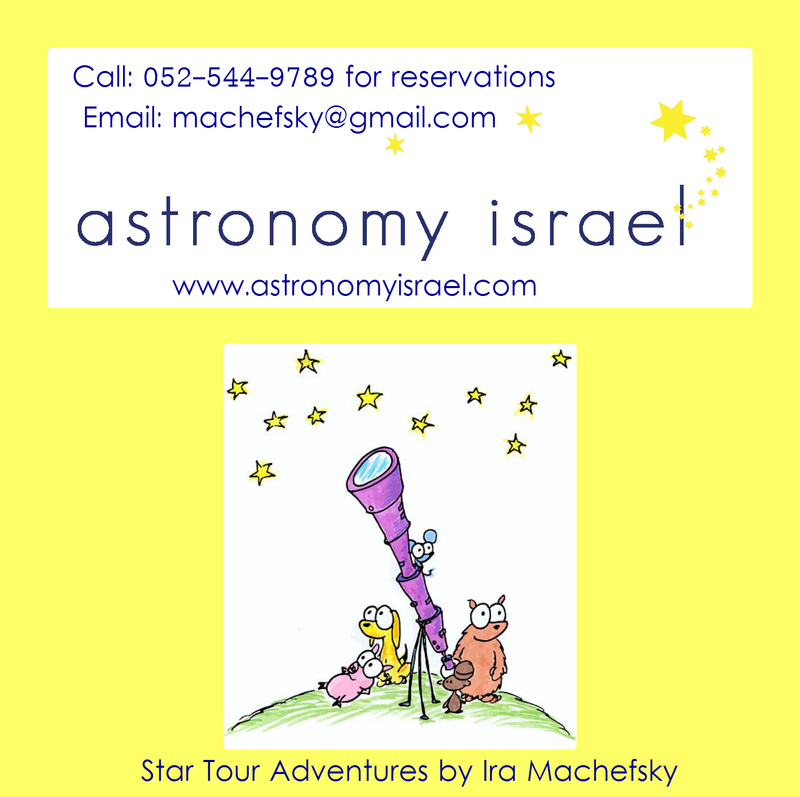 This year we will be doing both Hebrew and English tours of the night sky during the star party, with my co-pilot Ziv handling the Hebrew tour. The Alpaca Farm is just 5 minutes behind Mitzpe Ramon, down Ben Gurion Boulevard, the main road into Mitzpe Ramon. 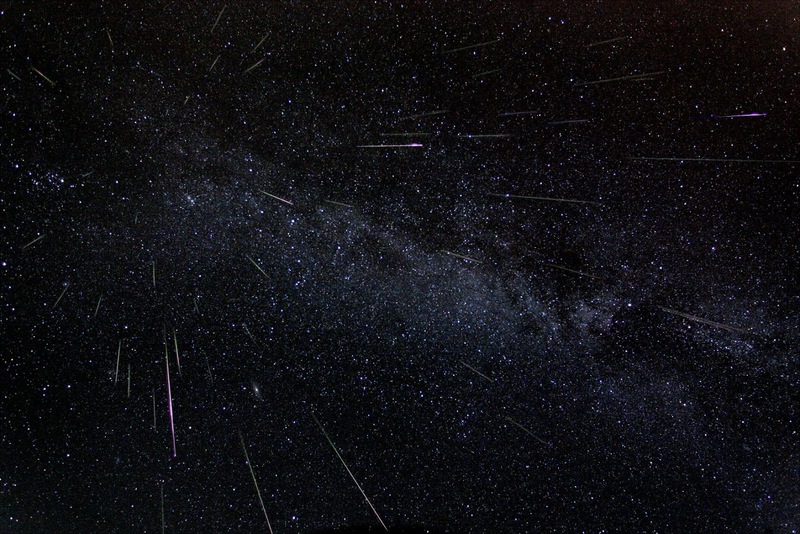 Meteors are what most people call "shooting stars" or "falling stars", but they are neither. They are bits of rock and debris from outer space that fall to earth and burn up from the heat of friction with the earth's atmosphere. 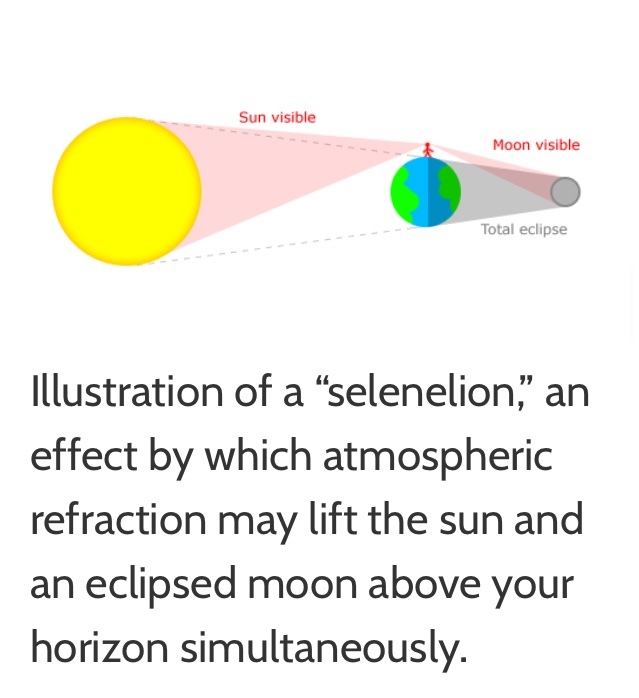 It's their light generated by friction with the earth's atmosphere that we see. Usually these rocks from space just fall randomly so we only see a few per night. But sometimes the earth passes through the orbit of an ancient comet, which disintegrates as it orbits the sun and leaves a debris trail behind. As the earth passes through this cometary debris trail scores of particles fall to earth simultaneously creating a meteor shower. 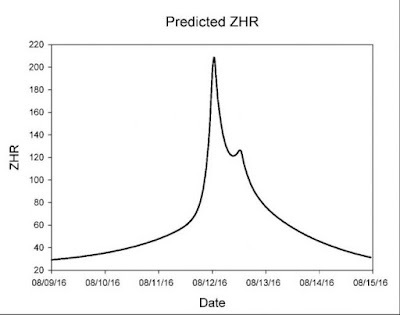 Really good showers like the Perseids can have peak rates in excess of 100 meteors per hour. Of course most of these are quite dim, but many bright ones are also visible creating "Ooohs" and "Ahhhs" from the onlookers. As the earth passes through the orbit of an ancient comet debris rains down of our planet creating a meteor shower. Israel is ideally placed this year to view the shower as the peak falls during the early morning hours of August 13 in this part of the world. 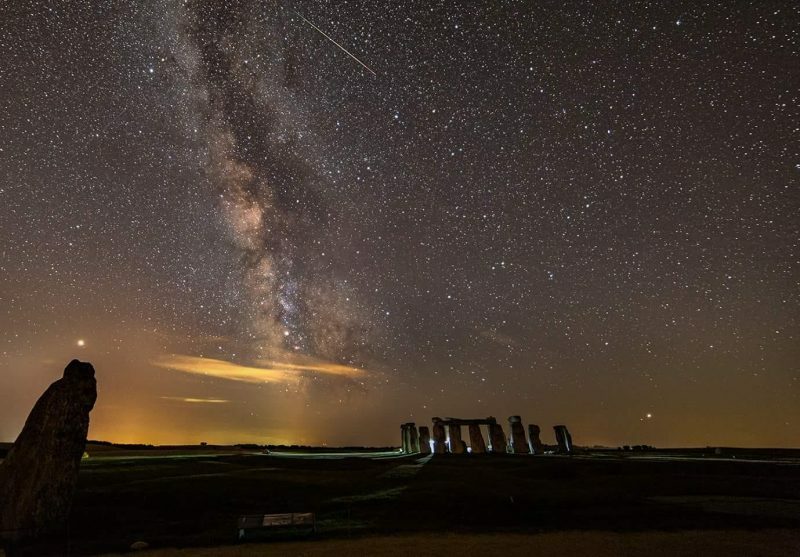 Meteor scientists are also predicting a mini-peak around 11:00PM on August 12 as the earth passes through a small stream of particles left behing by Comet Swift-Tuttle, the comet that is the origin of the debris that makes up the Perseids Meteor shower. Make sure to be out by then. If meteors are large enough they can survive their fiery fall through the earth's atmosphere and hit the ground, as the Chelyabinsk Meteor did. They then change their name to meteorites and can be found, collected and researched. They are primordial pieces of the solar system, over 4 billion years old. As usual I will have my large bag of magic "rocks from space" with me, and you will be able to hold real "shooting stars" in your hand. Also, as usual, we will be raffling off free meteorites every hour (retail value 50nis), and Yes, if you don't win one and really want to take one home we will sell them to you if you insist. 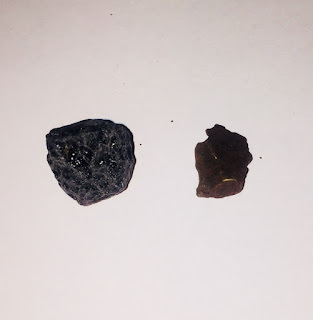 Two of the meteorite pairs we will be raffling at the star party: A Tektite (left)) and a fragment of the Campo del Cielo (right). 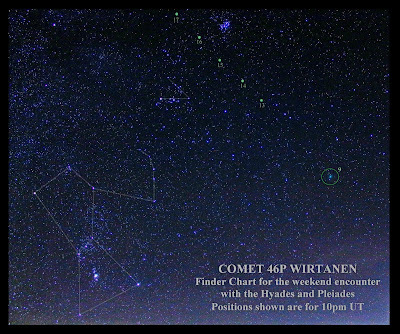 Meteors can be observed from any dark sky location and no optical equipment is needed or even desirable. 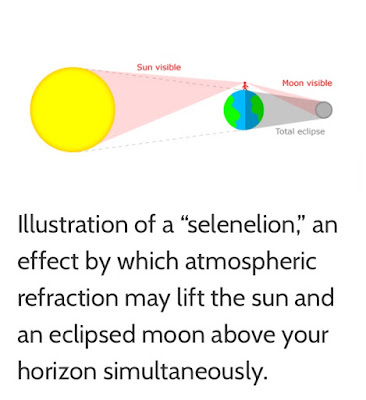 They can appear anywhere in the sky so the best place to see them is a dark sky location with open horizons. Just lie down on the ground and look up. That's why Mitzpe Ramon is such a popular location for viewing them. People often ask me where is a dark sky location besides Mitzpe and my answer is, "I don't know." 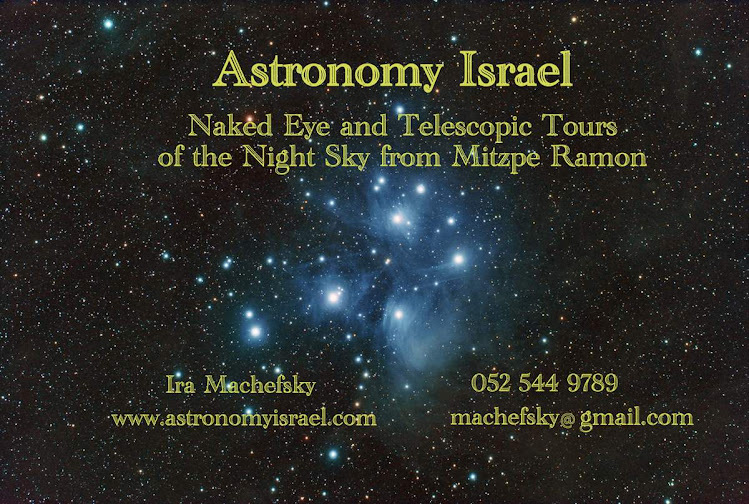 I do almost all my observing from Mitzpe. You know your own area better than I do.My impression is that in the center of the country along Route 35 and 38 there are a number of parks where the sky may be suitably dark, but I've never observed from there myself. If you trace the path of meteors in a shower back from their source they appear to emanate from a single location in the sky, a particular constellation, called the "radiant" of the shower. The Perseids appear to emanate from the constellation Perseus, just below Cassiopeia. as the radiant rises higher in the sky more meteors are seen. That happens after midnight in August which is why the early morning hours are usually the best for viewing the meteor shower. 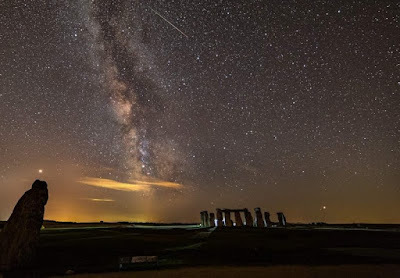 Time lapse photo of meteors appearing to emanate from the "radiant" in the constellation Perseus. As you can see from the above chart while the peak is quite sharp, which is why people try to come on the night of the peak, these is still quite an uptick in meteors 3-4 days before and after the peak and sometimes even longer than that, with rates in the 30 or so per hour, still far more than are seen on an average night. Of course most of these are quite dim, but there are still a few bright ones, fireballs, that make the night memorable, so it is also worth coming for a look at the shower a few days before or after the peak, although predicting what you will actually see then is impossible. But the sky will still be quite dark as there will still be no bright moon in the sky.